…and even one of me painting it (thanks dad!). 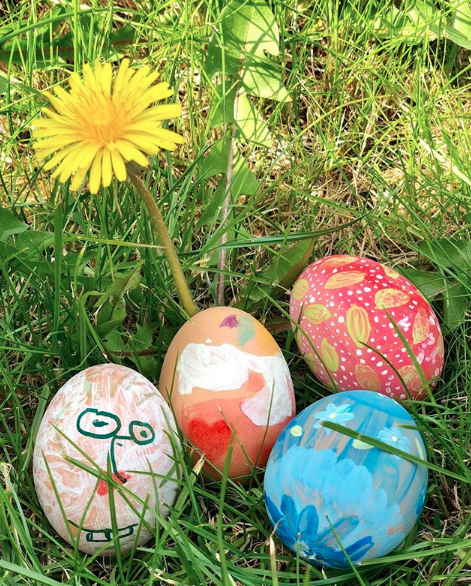 Here are some eggs I painted with my nieces (hint - that’s Olaf!). A very Happy Easter to you all! 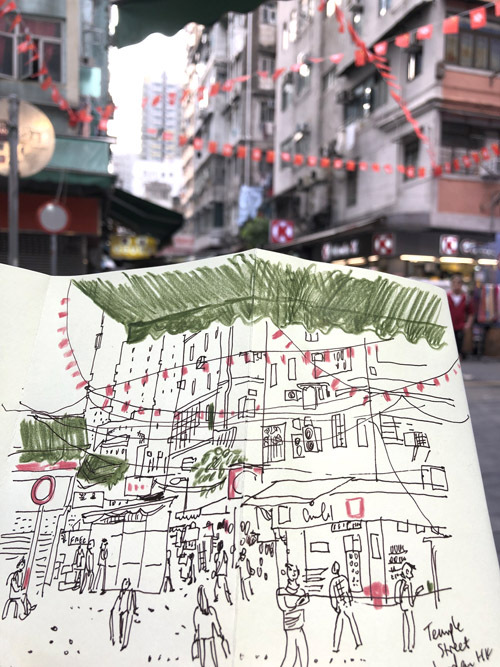 I’ve done lots of walks around smaller local streets on this visit, and I look for those hidden truly ‘HK’ views. I sat at one of the street restaurants and had a drink while I drew this scene in Jordan, at Temple Street Night Market. I liked something about the green awnings and red flags! I had a wonderful evening at the new nightspot Dai Bing, in Sheung Wan, and even managed a little sketch on a coaster. Many of the local shops have a guardian cat, and I love spotting them on the job. I’ve got a few more days left in HK, mostly spent in meetings, but on to London next! 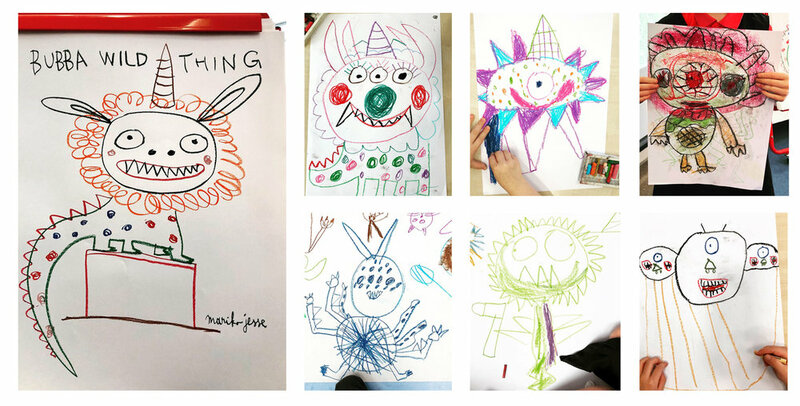 The last group was reading ‘Where the Wild Things Are’, so we designed our own wild things. I asked for suggestions and my wild thing had a unicorn’s horn, a lion’s mane and the body of a crocodile! 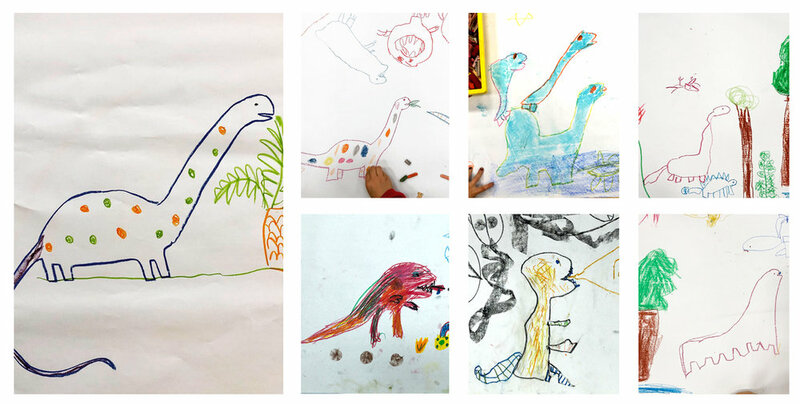 Each class drew together on a long scroll of paper to create a mural-type image. I think they enjoyed themselves!! I certainly did. …although you can see that the trees aren’t quite at peak blossom yet. and it was wonderful to stroll and enjoy the festival atmosphere! 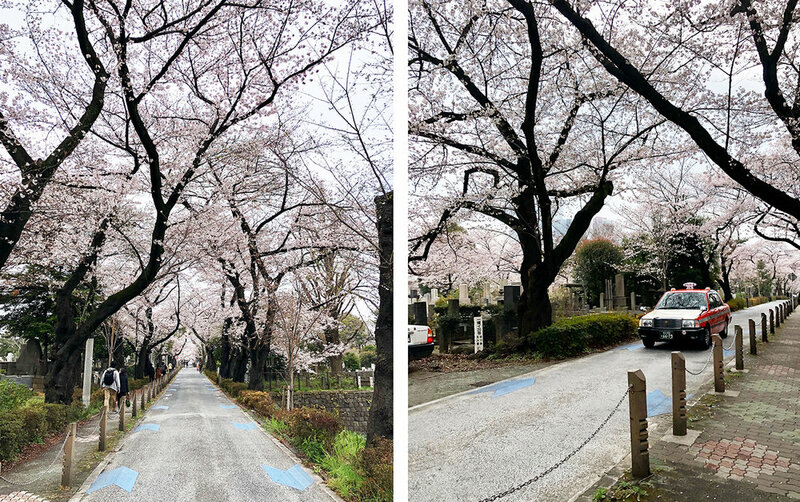 There are cherry trees in the normal streets too, and this one is on the way to my studio. I like the mix of camelia with cherry blossom. I love the cherry blossom season! faux, in HK, are having a super sale right now, and two of my rugs are extremely discounted. The first is based on one of my peony etchings. You can find it here. 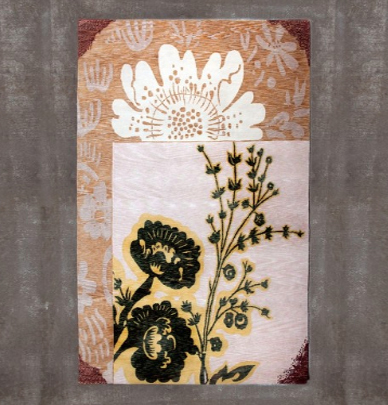 The other rug is based on a drawing I made of a bamboo plant, with patterned leaves. Here’s the link. 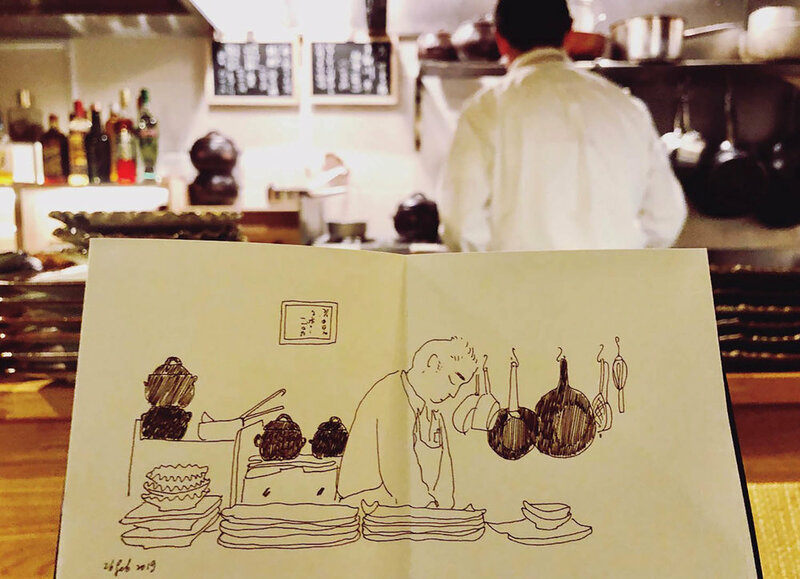 When we sit at the counter I often have time to sketch before we eat, but sometimes I take photos and do the sketches as soon as I get home, while the memories are still fresh. 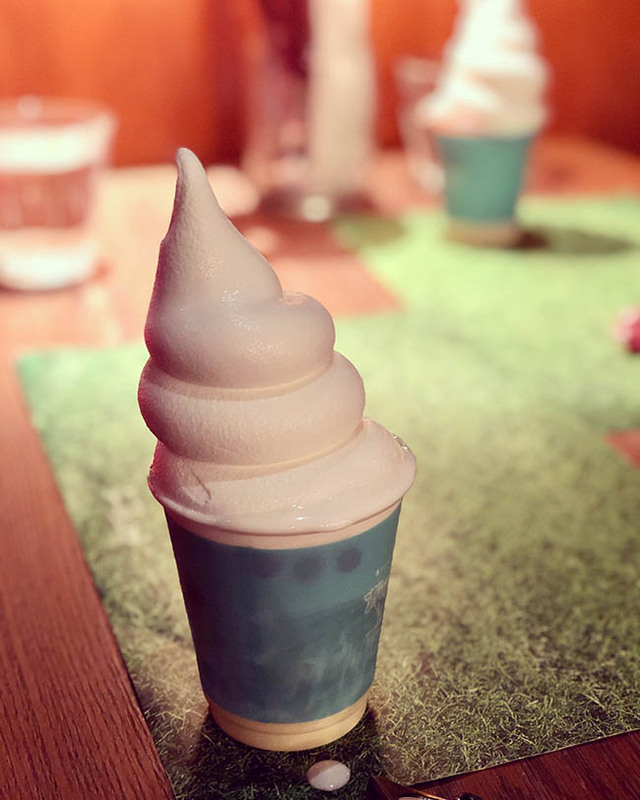 Sometimes, just a photograph will do, capturing the deliciousness! It didn’t exactly go as planned, but on the whole, I think it’s a good start! The plum blossom blooms about a month before the more famous cherry blossom, and we went to Umegaoka park in Tokyo to walk amongst the gently scented trees and enjoy the first hint of Spring. My favourite thing about the ume blossom is that there are so many different varieties and colours, from pure white to a deep crimson red. 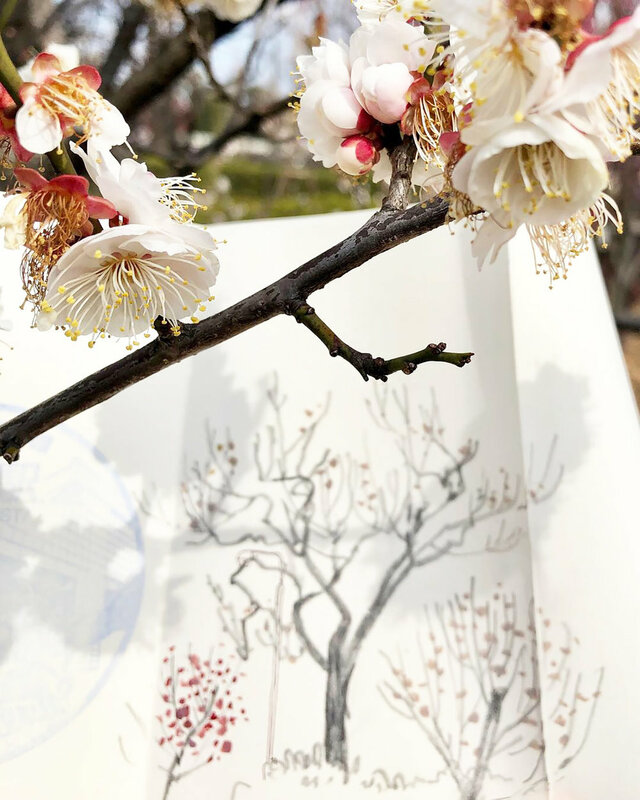 If you’re in Tokyo, hope you can take a moment to go and find some ume to enjoy! My ceramics are produced by faux, in Hong Kong. They are the stockists for some of the larger stores there, but it’s also possible to visit their wonderful showroom on the South Side of HK Island in Ap Lei Chau, overlooking the sea, and also to shop on their website. 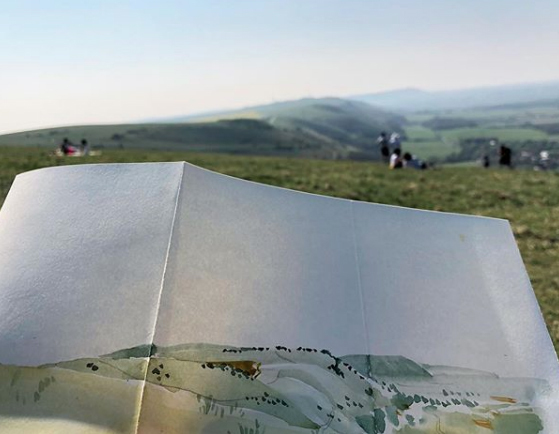 They’ve just revamped their online store and you can now buy my products from anywhere in the world, as it will automatically work out international shipping, hurrah! You can buy my Hong Kong Toile range, my Hong Kong Willow collection, and also my London Toile collection and smaller Beijing range too! Happy shopping! 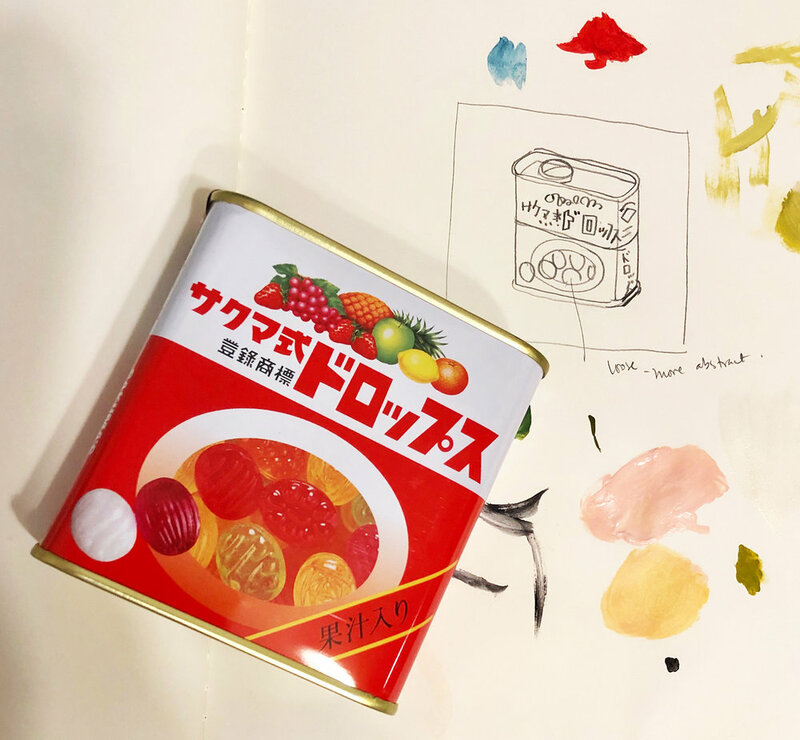 I recently went to Huntsville Alabama to meet with my friends Katie Baldwin and Yoonmi Nam, the other members of our art collective wood paper box. 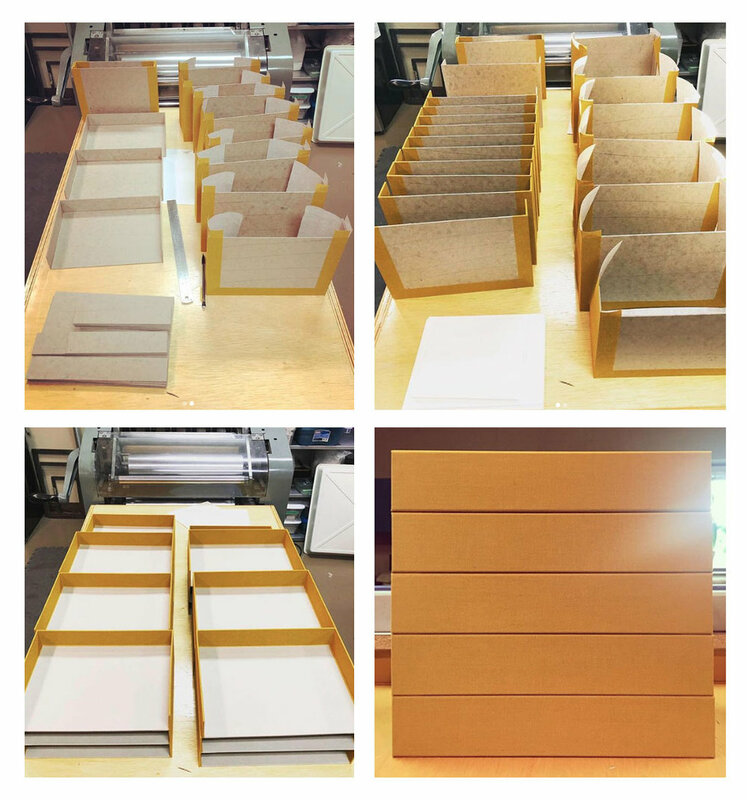 We got together to make the boxes for our third collaborative printmaking project, (un)fold. For this project we chose a mustardy yellow bookcloth, and grey paper for the inside. I always forget how long it takes to make clamshell boxes, but I always love how they turn out. I can’t wait to put all our lovely prints inside to complete the project! We also started our woodpaperbox instagram, please follow us for all our printmaking news! Here’s a little pig in my new HK willow pattern teacup wishing you all a fantastic, lucky and happy year! This year I designed a sweet tray with an special version of my new Hong Kong willow pattern. It’s available exclusively instore at Lane Crawford department store in Hong Kong, in a strictly limited edition. 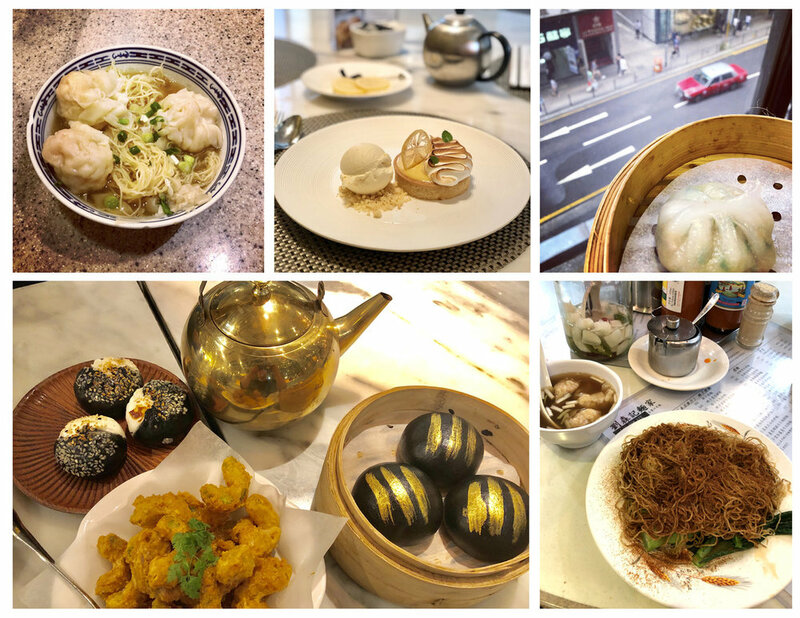 It features different areas of HK island in the individual segments of the tray, such as Wanchai and Happy Valley. The sweet tray is a traditional part of the Chinese New Year family celebration. It contains all the family’s favourite seasonal treats, such as mandarin segments, chocolate and nuts. If you bought one of my trays, I’d love to see how you use it this year! And most of all, a big Kung Hei Fat Choi to you all! May the year of the pig be a lucky one. Our Art Byte Critique group show in the details has been up and doing well all this week. I hung my frames salon style, in a sort of diamond shape, curating a selection of my ceramic/tea prints. It’s a lovely space, full of light, and all the artists’ work seems to complement each other super well. The reception event was extremely well attended last night, and a good time was had by all. Thank you if you came to visit! 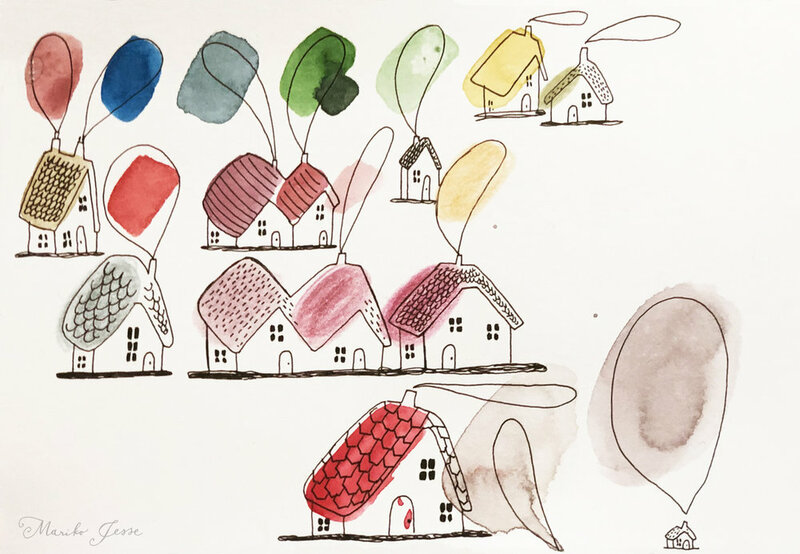 I did an artist interview for the in the details blog. You can read it here. The show is still on and closes tomorrow at 5pm. Hope you can make it! 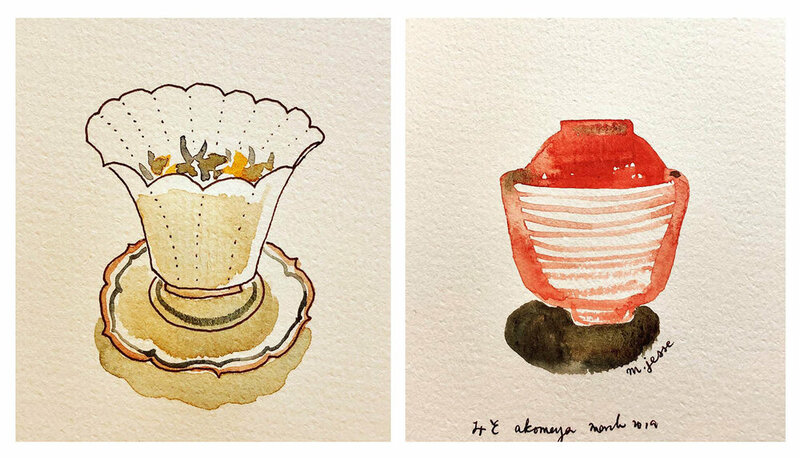 I’ve attempted to curate a small selection of my prints, in a way that makes sense thematically and visually, with tea, ceramics, and patterns of both East and West to hold everything together. I’ll be at the reception on friday evening, from 6pm, and occasionally at the show during the week. Hope to see you there! I’m taking part in a group exhibition in Tokyo, in 2 weeks time, and am trying to finish a few prints to show there. I’m also going to show a few of my older prints, both etchings and mokuhanga. Hope you’ll make it to the opening if you’re around! I’ll be there to meet you. We spent an incredible few days in Niseko, Hokkaido, between Christmas and New Year, staying with friends in their beautiful house in the snow. We did go outside, even snowshoeing (!) but most of our time was spent cosy inside, looking at the heavy snowfall, and I did lots of sketches of the wintery landscape. The sky changed constantly, from pure snow white to brilliant blue, and the trees were sometimes silhouettes and sometimes full of vivid colour. A very happy new year to you all, may 2019 be full of magical things! This year my Christmas card illustration was based on my family christmas tree, in our London home. We have a fir tree up to the ceiling, covered with lights and decorations. Our fairy, always sitting on top of the tree, was made by my grandmother in the 1920’s. We all adore her, she even has tartan bloomers on underneath her dress! Hope you all have a lovely, warm, and cosy holiday season, wherever you are! This year I was commissioned to create the illustrations for the ‘Winter Fest’ Christmas campaign for the Peak Tram in Hong Kong. The illustrations were used on the facade of the Peak Tower, and throughout the interiors of both the Tower and the Lower Peak Tram station. Unfortunately, my hand-lettering wasn’t used in the final designs, but I guess that happens a lot to illustrators! I hope the illustrations make all the visitors to the Peak feel happy and Christmassy!